Over 15 beaches welcomed dozens of volunteers from several different sectors to the traditional Riviera Nayarit Beach Cleanup Network, which this time around is receiving a special boost from TV Azteca’s national cleanup campaign. 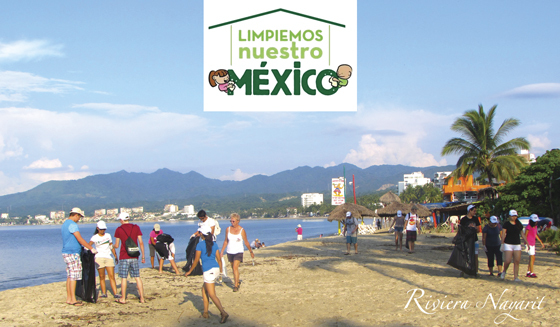 The 29th edition of the Riviera Nayarit’s Beach Cleanup Network (BCN), which is taking place on Saturday, October 8, 2016, will welcome special guest TV Azteca and its massive national cleanup campaign titled Limpiemos Nuestro México (Let’s Cleanup Our Mexico). “We’re still carrying out the monthly cleanup of the beaches in the Riviera Nayarit, but this time around it’s extra special because in addition to raising awareness about the need to care for the environment, we’re also getting fantastic exposure in the domestic market via the audience of TV Azteca, one of the country’s top networks,” said Marc Murphy, Managing Director of the Riviera Nayarit Convention and Visitors Bureau. Limpiemos Nuestro México encourages millions of people around the country to pick up tons of garbage and try to generate a global shift in favor of the environment. It visited the Riviera Nayarit for the first time in 2014 and has come back with even more energy to strengthen the BCN. Cleanup sites include: Boca de Tomates, Nuevo Vallarta, Bucerías, Playas de Huanacaxtle, La Cruz de Huanacaxtle Centro, Playa La Manzanilla, Playa Destiladeras, Punta de Mita, Islas Marietas, Sayulita, San Pancho, La Peñita de Jaltemba, Playa Platanitos, Playa El Borrego and Isla de Mexcaltitán. The civic organizations, businesses and authorities that will participate include: Hard Rock Hotel, Aquaventuras, Friends of Bucerías, Recolectivo Vivo, the Neighbors of Las Palmas Bucerías, Neighbors of Playas de Huanacaxtle, Tropical Incentives, Hotel Palladium, Fundación Punta de Mita and the communities of Corral del Risco and Emiliano Zapata, Bahía Unida A.C., Sayulita Limpia, Grano de Arena A.C., Platanitos Ecológico A.C., the Peace Corps/Conanp with the Unidad Académica Preparatoria no. 12, the Mexcaltitán Women’s Group and the Riviera Nayarit CVB.